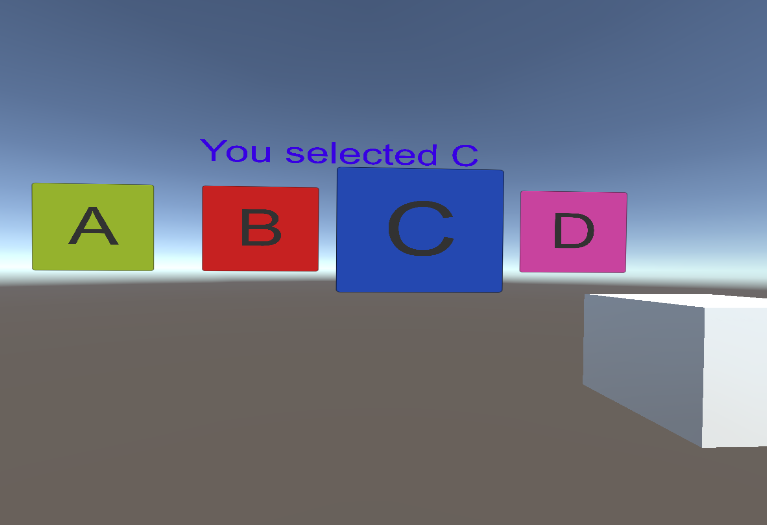 As VR developers we almost all need a UI system where the user can look at something and action it, such as a button. With Unity’s new UGUI (in 4.6 and 5) it finally makes it easy to build great world-space UI for input by mouse. But it doesn’t have anything out of the box for VR because it does not support a look-based input method (look at and object and press a key/button to select), or a gaze-based input method (auto-select after gazing for a period of time). It is left up to VR developers to keep re-inventing the wheel. There was this great thread New Unity UI + OVR Look-Based Input HOWTO on the Oculus forums that provides an approach to do look tracking with UGUI. It has evolved over the last 6 months to work with more of the built-in UI elements. It enables you to look at an element and select it by a key or button. Unity has published the full source code to their UGUI input system, making it possible to understand how the input modules work. What I wanted was a small and simple system that would do both look and gaze input and be very quick and easy to add to a project. So I created the GazeInputModule script below. The module can work as either gaze or look based. It leverages off the built-in Pointer Input Module which already has the code for tracking enter/exit on UI. The way UGUI input works is that you must create an Event System and then attach one or more input modules to it. 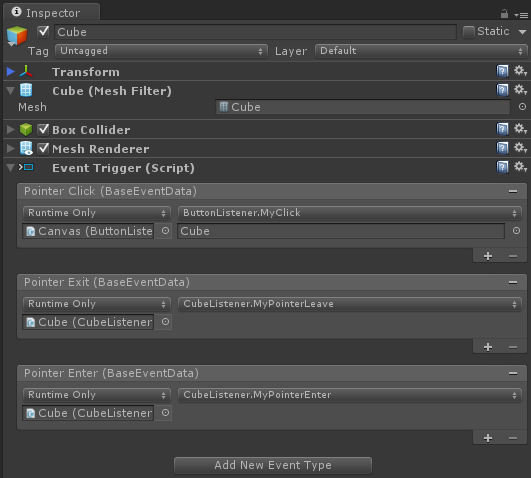 Unity creates you a game object with an Event System automatically if you add any UI to your scene in the editor. 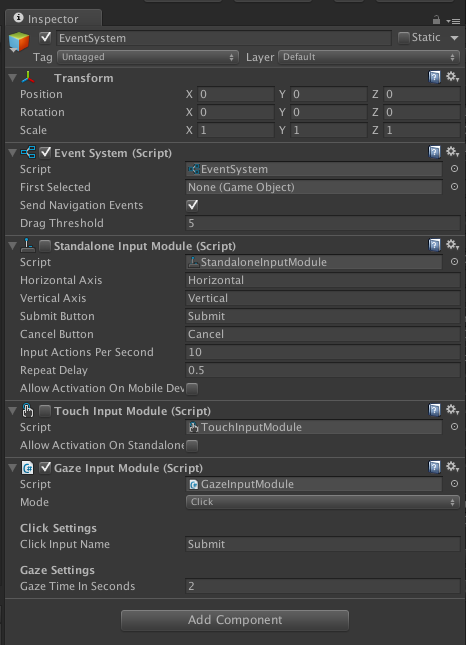 By default Unity creates you a Standalone-Input-Module and a Touch-Input-Module. My new input module should *replace* the existing ones, as we can’t have both the mouse and head tracking the same elements (because which should be active if both the mouse and head are pointing at different elements?). Finally choose Click or Gaze methods. For Click, look at a button and press theXBox Controller “A” key or press the “Spacebar” on your keyboard. For Gaze, look at a button for 2 seconds. 1. Drag it onto your EventSystem object. 2. Disable any other Input Modules (eg: StandaloneInputModule & TouchInputModule) as they will fight over selections. 3. Make sure your Canvas is in world space and has a GraphicRaycaster (A canvas created in the Editor gets one automatically). 4. If you have multiple cameras then make sure to drag your center camera into the canvas. If you are using the FirstPersonController be aware that it totally breaks Canvas UI ! This is because the mouse code in it resets the camera orientation every frame during Update() for both mouse rotation horizotnal and vertical, and also head bobbing effect. To fix it: Firstly turn off head bob property in the inspector. Then either disable the mouse code completely in FirstPersonController (comment out RotateView() call in Update()), or alternatively to keep mouse to turn your body, edit the MouseLook.cs file and comment out the 2 places it calls camera.localRotation in LookRotation() file. (Another alternative for a super quick fix is to rename Update() to be LateUpdate() so the Canvas UI raycasts run before the orientation is messed up. But it may mess up other timings in your app, so best to edit MouseLook). What about if you don’t want to select only UI, but also 3d scene objects? To do that add a PhysicsRaycaster to your camera (not the canvas, but directly onto your VR camera). Then results from our raycasts will include anything with a Collider. Then for any object you want to interact with, add an Event Trigger component. By default these are based on PointerClick base which is exactly what we need. Now, simply press the “Add New Event Type” button and add any event you want such as PointerClick (for the click event), or maybe PointerEnter and PointerExit to handle the game object becoming hilighted. Lets add a crosshair to the above. There is the awesome YouTube video Oculus Rift DK2 – Unity Tutorial: Reticle that goes into full details about how to create a VR crosshair. Adding the crosshair image can be achieved using standard Unity techniques: Simply create a game object with a 3d Quad as a child of the VR camera and position it out in front of the user. Attach a material with the crosshair image (using a transparent unlit shader). I’ve created a GazeInputModuleCrosshair script that simply looks at our GazeInputModule script to determine if we’re looking at something, and if we are use that distance to move our crosshair. I also added a static DisplayCrosshair property so any script can easily show or hide the crosshair as needed. In the video above, for the first half I don’t show the crosshair, then I turn it on my pressing the “C” key. // 1. Drag onto your EventSystem game object. // 2. Disable any other Input Modules (eg: StandaloneInputModule & TouchInputModule) as they will fight over selections. // 3. 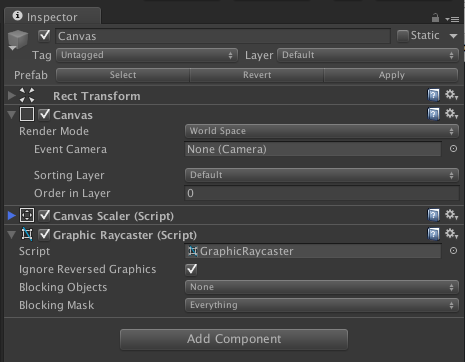 Make sure your Canvas is in world space and has a GraphicRaycaster (should by default). // 4. If you have multiple cameras then make sure to drag your VR (center eye) camera into the canvas. I tried the attached unity package file. Opened in unity 5 , added a quad object and gave a cursor material. Have placed a camera in the centereyeanchor and used that camera in the canvas. When i try to run in unity i did not get any errors but there is no cursor appearing in the scene what i gave as texture and using the mousecursor when i click on any of the buttons i do not get any output. It appears to be because you are using the Oculus OVRPlayerController, whilst I used Unity native VR. I do see everything works in terms of looking and selecting, except the crosshair is not aligned with where the user is looking and is at the wrong distance. So false alarm, everything above also works fine with OVRPlayerController. Murali’s issue was the crosshair was not aligned (set to 0,0,2) in world space in front of the camera, and also that the cross hair used the wrong shader (his image did not contain alpha, so Unlit/Transparent shader would do clipping and z incorrectly – his crosshair fix is to use Unlit/Transparent Cutout. I have a problem using your script with Google Cardboard. I added script to EventSystem object in the scene and tisable Touch and Standalone modules. After that i need to return from cardboard mode to simple camera with Touch module enabled. I disable Gaze script and enable Touch module. But after that touch begins to work only with second finger. I Mean if i want to push the button i need to touch the screen by one finger and while touching push the button by other finger. Do you have any ideas why is that and how to solve the problem. I tried to delete Gaze script, update modules, load different scene but nothing helped. There is some inter-connectedness between the gaze and touch input modules because they are both using the same event system. If you are going to use both touch and gaze, possibly you may need to create separate event systems (eg: 2 game objects) and enable disable them as needed. Let me know if that works for you! I’m trying to write in an InputField control after looking at it and clicking (or waiting 2 seconds) but I haven’t achieved it yet. Do you know how to do it? When I press the space bar, the cursor appears in a weird place inside the canvas and the InputField control remains hightlighted. Letters don’t appear anywhere. Did you work it out? Download the sample unitypackage at the bottom of the article. First of all, thank you very much for your work; you really helped me. This being said, I am having the same problem. I already downloaded the demo and whenever I tried to write in the InputField (after selecting it, which worked fine) it didn’t write what I pressed on the keyboard. First of all, Thanks a lot for making this tutorial. It was so nice and useful when I was really blinking and clueless of how to implement this look based input (Eye-Picking). I am developing a VR app for Samsung GearVR. I just want to clarify whether this script and concept will work on GearVR too?? As this is also based on oculus. So, I guess this will work on GearVR too. Hi Jeeva. Yes, it works perfectly fine in GearVR. I use it in both DK2 and GearVR. Hi Jeeva. Yes it all works on GearVR too. If you aren’t using the timer based input, you need to map a button press of the GearVR to be the click – you can use any click on the touch pad – or the ESC key maps to the physical back button. Could this possibly be due to me currently still having to use Oculus 0.4.4 or have I missed something obvious? I copy pasted the GazeInputModule.cs code from the website instead of using the download version, It all appears to be working now. I just wanted to say thank you so much for putting this tutorial together and providing the GazeInputModule. I’m attempting to create VR games for Oculus Rift in Unity as a hobby and am really new to game development. I’ve been struggling to determine how people are making the gaze menus and your tutorial and script is absolutely perfect! Thanks for your comment Jim. With Unity a key player in VR I’m still surprised they haven’t added in a look based input module, or a world-space keyboard! One big comment though is that I see your cursor script is using EventTriggers, as an FYI, it is not a good idea to recommend these as they are overly heavy, better to implement the interface handlers for the events you want to publish. Hi Simon. Your unity-ui-extensions project is fantastic. It is great to see code brought together into a common library. I’ll create some pull requests with some suggested code merges. Brilliant Tutorial.. Its been very helpful for me to develop my own projects with this Gaze at script. If you dont mind I’m struggling with 2 things though. 1 – On the example scene you supplied – the crosshair dissapears if it is not hovering on / very close toe the 4 buttons you have. – How would i make it so the crosshair is visible all of the time no matter where you look? 2 – When the crosshair is looking at a button.. How would be the best way for me to implement a countdown timer for the duration it takes the person to look at and select the button? Just a simple animated Icon or something would be great and what would be the best format for this? Thanks very much.. your tutorial has been very helpful so far. thanks very much again for a great tutorial. That’s a great idea. We could use an animated sprite for the crosshair and make it fill up over the time period. I’ll have a look into that!! Is it possible to load new scenes in those colourful squares of yours? If so, how? And using the inspector tell the click event to call it, or use the code a few comments up named ButtonClickHandler. I’m able to load a new scene, but for some reason the UI stops functioning in that loaded scene. Do you know why that is? Thanks for this awesome article. I have been experimenting with the OVRPlayerController and the GazeInputModule, and once I add a Physics Raycaster to the CenterEyeAnchor and set up a Cube with IPointerClick/Enter/ExitHandler on which I implement OnPointerEnter and OnPointerExit to change the material, I get heavy flickering. When I add logging to GazeInputModule, I can see that there is a constant triggering in HandleSelection between pointerEventData.pointerEnter == null and it not being null, even though I am not moving my pointer. Any suggestions on this? Thanks in advance. Now I ‘m working on adapting your script to accomodate “gaze” sliders as well. I’ve checked the article on the Oculus forum and I’m wrapping my head around the event system. Is this a good approach? Can you give me some pointers on how to achieve this using your work as a base? First of all, thanks for sharing your solution. I’m dealing with Unity 5.2.0f3 and Oculus DK2. I’ve downloaded your Demo GazeInput.unitypackage. Everything seems to run well besides the action that should be run after a fixed time of gazing (for example your function MyClick after a button is selected). According to you script ButtonListener.cs I should see a selected button text in Console. Unfortunately, I can’t. All associations functions with GUI are correct. While debugging the function MyClick is not run. In fact, I have no idea what’s wrong. Could you identify possible problems. Please forgive me my earlier post. Everything works perfectly! I tried to run it before well reading your article. Shame on me! If Click option is set I should press a spacebar if Gaze option is set everything works perfect. Iam using the gazeinput module in my project and this works fine. I use a game pad in order to navigate. I use oculus utilities and OVRPlayercontroller. Now when I gaze at an object iam able to get the selection. How can I make the OVRPlayercontroller navigate towards that object without the gamepad interaction. Did you ever try this with the Gear VR? Unfortunately I can’t seem to get your demo scene working with it. Do you know any solutions? Thank you for this great tutorial. I just began to study Unity VR. I try your GazeInput unitypackage in the 3Glasses* device. Gaze input of buttons is work but cubes can’t be triggered. I don’t understand how to drag multiple VR cameras onto Cavas. Can you give me some pointers on how to achieve this using your work as a base? I’m attempting to use this tutorial with the gear VR on a samsung s6 edge. When the input is in gaze mode, it works perfectly. However, when I try it in click mode with the gear VR’s touchpad, it doesn’t respond. The touchpad has been working when I use Input.GetMouseButtonUp(0) in the Update function, so I can’t seem to figure out why it doesn’t trigger the onClick functions for the buttons. Any advice you have would be greatly appreciated! Hi Brian. Have you disabled the default input managers? Or at least made them a lower priority then the GazeInputManager? Hi Peter, I have followed your steps, but when I look into a button, nothing really changes. What to do? Can you kindly leave a reply soon please? Hi, Is it a 3D object or a Canvas UI? You need to make sure the correct event system and raycaster is in your scene. Feel free to email me a test scene from your project. When I recreate the gaze pointer using their project file, everything works as it should. However, when I use a blank project file and set up the same scene, the gaze pointer vanishes behind gazable objects. I’ve been trying to figure out what is happening to no avail. Hi Marc. That runs perfectly in Unity 5.3.4p1. The problem you are seeing must be an issue with Unity 5.4 beta! How to work gaze for slider? Hi, you’ll need to use a more advanced input method for sliders. My input is really for buttons only! Hi Peter, I am developing Gear VR games as a hobby. I implemented your Gear VR touchpad controls and the gaze input, it works like a charm!! Next I will install the crosshairs too. I saw you also have the Gazefuse option, absolutely brilliant! I’ll also use the screenfader when shifting scenes. I don’t know how to thank you, your the best! Keep up the good work! O yeah, one last question, is it possible to get the crosshair to only show up when looking at/near an object collider / button etc? Everything works like a charm, brillliant!! Thank you so very much! One question, is there a possibility to transform the crosshair to the normal of the object? With RaycastHit.normal? Hey Peter, great tutorial, has helped me a lot on my project. 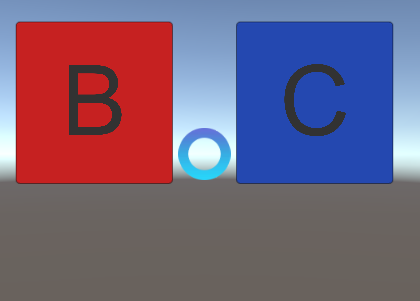 I have a basic load level method after staring at a button on the UI Canvas; it works great when testing it on Unity, however when I build it for Gear VR it doesn’t work (The reticle is there but it doesn’t interact with the buttons). The fuze circle from your other tutorial isn’t filling also (on Gear). Any idea what could be causing this? Very well written post. I’m having trouble implementing this in unity’s 5.4.0b24. Not even the included demo works as shown in the video. (the buttons are not popping out, and the cubes are not being highlighted). I assume is a beta problem. Any help at all would be great. I’ve tried what you described above and it works fine in 5.3. However in 5.4 it works partly, because there seems to be an offset. Because when I aim at the buttons, there is not interaction. However when I aim above the buttons, I see I interact with the buttons while not actually hover over them. Could you clear out what exactly happens in Unity 5.4. I think they changed something with the PointerEventData, but while I read all change logs, I can’t find what they exactly changed. Hi there, you saved my day! I had missed your post before I posted about the same problem. Thanks for the fix! Where did you put the above code? Found it! It’s on the GazeInputModule script under HandleLook method. Thanks! After upgrading to Unity 5.4 it looks like something is broken. The gaze input does not work anymore. Any suggestions to fix this? Never mind, JDMulti’s fix is working! in GazeIm[putModule then you have also mouseInput instead of GamePadInput. I can’t get the official package work in U 2017.3.1. Everything works in editor, but when I try GearVR, the input module is not working (regardless gaze/click). Thanks in advance!